GLOSS Moderne is Eco-Luxe. 100% Sulfate-Free + Paraben-Free. Luxury haircare with technically-advanced, ultra-prestige formulations for every man, woman and child. Developed by the beauty industry's top experts and the best chemists in the world, their award-winning Eco-Luxe Haircare Collection was created with the latest haircare technology for unparalleled efficacy. Combining performance with all the sensorial aspects of Beauty, GLOSS Moderne is the epitome of luxury. Their signature Coco de Soleil fragrance was created by one of the most highly acclaimed global fragrance houses... a sensual, intoxicating fragrance reminiscent of the French Riviera. GLOSS Moderne is truly a sensory experience. GLOSS Moderne is Good For You + Good For the Planet. In addition to preserving color and all hair treatments, this collection addresses the environmental aspects of sulfates harming our oceans. Plus without bulking agents and fillers, the formulas are super-concentrated. No parabens, sulfates, sodium chloride, gluten or animal testing - ever. Runway-ready hair without chemicals. If you desire luxury haircare without potentially unsafe chemicals, GLOSS Moderne is the brand of choice. This eco-friendly brand creates high-gloss shampoo, conditioner, serums and masks to suit a variety of hair types. With no parabens or sulfates, GLOSS Moderne products are safe for men, women and children. Luxury without harm. Most beauty products contain deadly toxins. They are absorbed directly into your bloodstream through your skin. Because your body is unable to break them down, these chemicals accumulate and can cause untold damage. GLOSS Moderne is a brand that cares about not only the environment, but its customers. The company is true to its vision and passion of conservation and giving back. GLOSS Moderne is an indie beauty company that is not solely focused on marketing gimmicks. It is also focused on keeping you healthy. 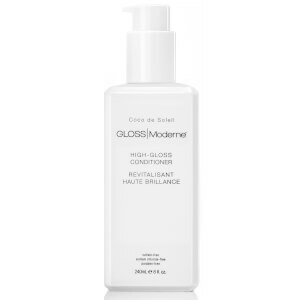 If you're ready to look great and feel great, try one of GLOSS Moderne's luxurious hair care products today.